"The problem with addiction is that because of the shame that's associated with it, people don't go and ask for help until the person is literally on fire," says Elizabeth Chance, an addiction recovery specialist on the Main Line. "That's when I get the phone calls." Elizabeth Chance cannot cure a person battling substance abuse. Ultimately, only that person can pry loose the tight grip of addiction. But she understands the struggle in a way that few certified recovery specialists do. That's because Chance herself is in long-term recovery. After abusing alcohol for decades, Chance took her last drink 10 years ago. 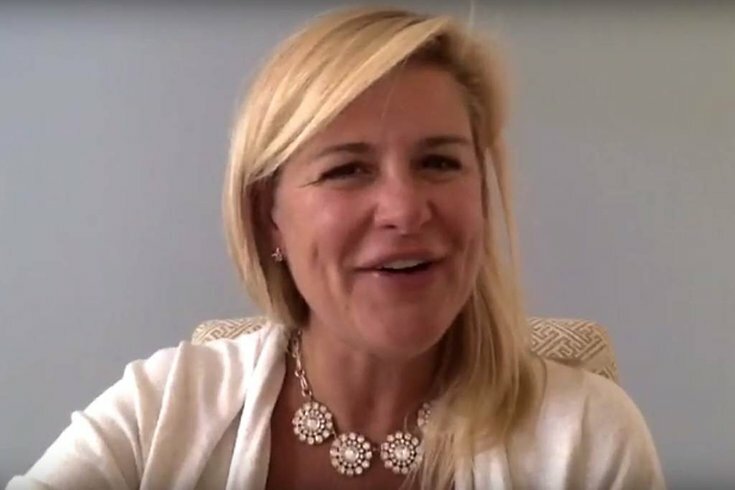 In the years since, she launched Busy Living Sober, a Radnor-based nonprofit that aims to eliminate the stigmas encompassing addiction and guide people — and their families — toward recovery. She also counsels people struggling with varied addictions. "I'm there to slow everybody down, to take a deep breath," Chance said. "Let's regroup and find out what's right for your individual family member." The sea of recovery options can overwhelm a family seeking to help a loved one, especially when they're in such a vulnerable state, Chance said. As a recovery coach, Chance navigates the family through the varied options available, but also maintains daily contact with the person battling addiction. Through daily phone calls and scheduled counseling sessions, Chance offers guidance and accountability, often checking to see how an individual is handling the temptations that arise. She offers compassion, understanding and, when necessary, tough love. "We can meld and we can talk to each other," Chance said. "They don't feel so ashamed and they can talk about it. I want to hear about their family and what took them there." For one 47-year-old woman, that not only meant coping with the death of her husband, but also learning to like — and accept — herself again. Chance has an "uncanny" ability to get to the root of someone's struggles, she said. "She really honed in on that 'You have to learn how to like yourself' piece very quickly after meeting me," said the woman, who requested to remain anonymous. "It was something that I wasn't getting anywhere else and it was like a light bulb for me." Without the help of Chance — and her frequent check-ins — the woman doubts she would have found the peace she now enjoys. "In the beginning she was checking in on me a lot," the woman said. "It's nice. You feel like you have this guardian angel walking around with you who is ready to help you at any time." Chance limits herself to working with two or three families at any given time. She expends a lot of energy, but Chance also asks a lot of the families, urging them to help establish the daily regimen she deems essential to a someone in recovery. "What are you eating? What's your day look like?" Chance said. "Everybody needs to have some sort of plan, especially addicts. It's so much easier if you know what you're going to be doing." The heroin epidemic sweeping the nation has pushed addiction to the forefront, prompting national headlines and governmental strategies to halt its growth. Some 1.9 million Americans, aged 12 or older, had a substance abuse disorder involving prescription painkillers in 2014, according to the latest figures released by the American Society of Addiction Medicine. Another 586,000 had a disorder involving heroin. There was 47,055 lethal drug overdoses, including 18,893 from painkillers and 10,574 from heroin. Alcohol abuse is even more widespread, though it has received a fraction of the attention in recent years. Some 16.3 million adults had an alcohol use disorder in 2014, according to the National Institute on Alcohol Abuse and Alcoholism. That figure accounted for 6.8 percent of American adults. Nearly 88,000 people die from alcohol-related causes every year. The Main Line counselor assists people struggling with all kinds of addiction. Regardless of the substance, the pathway to recovery is difficult. And it often doesn't start until people are extremely hooked. "The problem with addiction is that because of the shame that's associated with it, people don't go and ask for help until the person is literally on fire," Chance said. "That's when I get the phone calls." That's partly why Chance founded Busy Living Sober, which through speaking engagements seeks to bring greater awareness to addiction and its causes. "Let's get rid of the shame," Chance said. "Let's help these people. Let's get help to these people before they're on fire, before it's too late. Too many people die of these diseases each year. We've got to change that." It's a stigma Chance knows too well. Chance took her first drink at age 13. She immediately became what she termed a "blackout" drinker. And her habits only worsened as her parents divorced two years later. For Chance, alcohol numbed the pain. Although she had two grandmothers who struggled with alcohol abuse, Chance did not recognize the genetic implications of alcoholism. At age 18, she crashed her car while driving drunk. Her dad put her in rehab; her mom pulled her out. Off at college, her drinking continued. "I was a mess," Chance said. "I somehow managed. But I woke up all the time going, 'What did I do the night before? Where's my car? Are there mirrors on the car?'" Life continued, despite her drinking habits. Chance married and had three children. When she divorced in 2004, Chance said she felt as if she had thrown a grenade into her home. Again, she sought refuge in the bottle. Again, to no avail. "I picked up booze like it was my god," Chance said. "It was the only way I could cope with life. I drank and drank and drank and drank. I woke up in the morning saying I wouldn't do it again. But I'd do it again." It took her new brother-in-law, who had been in recovery for years, to call her out. At first, Chance was indignant. She drove to the beach and went a night without a drink, assuring herself she was not an alcoholic. But the next night proved her wrong. It started with the offer of a drink. It ended with her sitting alone on a dock, drunk dialing people across the country into the wee hours of the morning. "I woke up the next morning and said I can't do this anymore," Chance said. "I hated myself so much that I couldn't look in the mirror. There was no iron around my wrist or sirens chasing me. I hated me. I was done. ... That was it. That was the last drink I had." From there, Chance worked through a 12-step program and learned how to resist temptations to drink. On a trip to Napa, California, which occurred just as her ex-husband was remarrying, she went to meetings every day. "I wanted to be sober more than I wanted to drink," Chance said. "That is truly what has saved me this whole time. I remember that feeling of self-hate and self-loathing and looking into the mirror. Not being able to like yourself is hell on earth. I never wanted to feel like that again." Now, Chance has an opportunity to help others attain that same desire — and then guide them forward. Chance, a graduate of George Washington University who previously worked at QVC and CBS Television, had been running a concierge business she founded after getting sober. But about four years ago, she decided to be become a recovery specialist. "I wish that every person that has this disease had that ability to get that life back," Chance said. "But it takes time. Sometimes, it takes leaving your family of origin. Sometimes, it takes moving away. Whatever it is that you feel you have to do to get to the place where you're OK, do it." One 29-year-old woman sought out Chance last spring — even as she marked 10 years sober. The woman, who requested anonymity, had encountered marriage difficulties. The temptation to drink returned. "She goes through a lot of the same things I'm dealing with right now," the woman said. "She just shows so much love and kindness. For me, that's what I need to stay sober. I need someone who is going to hold my hand and tell me when I'm going wrong and vow to work with me." To Chance, it is essential to have an "evacuation plan" for when temptations arise. Who are you going to call? Where are you going to go? What action will you take? For a recovering alcoholic, that can be particularly tough. Alcohol is legal. And present nearly everywhere, from weddings to holiday gatherings to Sunday afternoon commercials. "You can't go in and think you're going to wing it," Chance said. "If you think you're going to wing it, it's never going to work." When a person battling substance abuse reaches a turning point — when they desire to be sober more than to be high or drunk — is a magical moment, she said. "You see a twinkle in their eye," Chance said. "When that person feels it, oh my gosh, you just feel it. The hope and grace that comes back into them. You can see it in their eyes."